So begins the poem that prefaces Lewis Carroll’s Alice’s Adventures in Wonderland. It refers to the day the author, real name Charles Dodgson, first told his story on a boat trip along the River Thames at Oxford, known as the Isis. Accompanying him on this picnic outing were 10-year-old Alice Liddell and her two sisters Lorina and Edith. They were the children of Henry Liddell, the Vice-Chancellor of Oxford University and Dean of Christ Church, the Oxford college at which Dodgson, then 24-years-old, was a mathematics don. Rowing the boat was Dodgson’s friend Canon Robinson Duckworth. The journey on that “golden afternoon” began at Salter’s boatyard (still there) by Folly Bridge in the centre of Oxford and ended five miles away in the village of Godstow. As it continued, Carroll related his story about the adventures young Alice had experienced after she followed a bespectacled white rabbit down a rabbit-hole. Carroll had made up countless stories like this to the children before, but on this occasion the young Alice who was the focus of the tale, begged him to write it down. This he did gradually, expanding the text and adding his own illustrations. Some 16 months later, he handed her the manuscript entitled Alice’s Adventures Under Ground. The original hand-written manuscript still survives and is housed in the British Library in London. Within a year though, Carroll had refined it further, commissioned the famous Punch cartoonist John Tenniel to draw the illustrations for it and in 1865 McMillan published it under the title Alice’s Adventures in Wonderland. Seven years later came the sequel Through the Looking-Glass. Since then the books have entranced children and adults alike, capturing the essence of childhood on glorious summer days in a topsy-turvy wonderland of innocent mayhem. For Alice lovers, Oxford still echoes a century and a half later, with places and faces that inspired Lewis Carroll’s work. The names of those in the boat provided several characters in the book. Apart from Alice herself, Canon Duckworth was the Duck, the Lory refers to Lorina Liddell, the Eaglet to Edith Liddell and Dodgson himself was the Dodo. Dodgson had a stammer and often called himself Dodo Dodgson. Alice would have known what a Dodo was since remains of that extinct creature and a painting of how it would have looked are displayed at Oxford University’s Museum of Natural History in Parks Road. In the book, it is the Dodo that decides that in order to dry all the animals that became wet having swum in the Pool of Tears they should take part in a Caucus Race, which was run in a circle in such chaos that nobody knew who won. This episode was inspired by a real life event when on a similar boat trip Dodgson and the children were drenched in a rainstorm near Sandford Lock. Dodgson knew the schoolteacher there, a Mrs Boughton, and they were able to dry themselves off in her house, which still stands next to the church. In the village of Binsey that the group would have passed on the way to Godstow, is situated a well in the graveyard of St Margaret’s Church known as the Treacle Well and referred to by the Dormouse at the Mad Tea party. He declared that the three little sisters lived at the bottom of it. The real Alice would have known about this Treacle Well since her Governess, Miss Prickett, who is almost certainly the model for the Red Queen in Through the Looking-Glass, lived in the village. Legend says that King Algar chased St Frideswide, Oxford’s patron saint, to Binsey in the middle-ages. He wanted to marry her but was struck blind by his boldness. Her prayers to St Margaret brought on a miracle; a well was discovered full of treacle, a healing liquid, which restored her suitor’s sight and caused him to depart. It also enabled her to return to Oxford where she founded a monastery on the site of what is now Christ Church College. In the cathedral at Christ Church a beautiful stain glass window designed by the pre-Raphaelite artist Sir Edward Burne-Jones has a panel depicting St Frideswide and the Treacle Well legend and was erected in 1860 shortly before Lewis Carroll first told his tale. Christ Church is the centrepiece of Lewis Carroll’s Wonderland. It was founded by Henry VIII in 1532 and the catchphrase of the Queen of Hearts character, “off with her head” is believed to be a reference to Henry’s propensity to have his wives executed. Carroll lived for 47 years in the college, 30 of them in the same rooms. These rooms overlooked the Dean’s Garden where he first caught sight of the Liddell children at play. He would regularly accompany them, usually with their mother or governess, on walks through Christ Church Meadow and along the river. Today, local historian Mark Davies organises a walk that traces their footsteps and illustrates the essential role played by the River Thames in inspiring the stories and in the friendship between Lewis Carroll and Alice Liddell. Close by Folly Bridge stands the house of Sir Tom Randall, a former hatter who became Lord Mayor of Oxford who was well known to Carroll and the Liddell family and who some believe inspired the Mad Hatter character. Others believe Theophilus Carter, a well-known Oxford upholsterer and eccentric may have also been the inspiration, at least for John Tenniel’s original illustrations. Carter invented an Alarm Clock Bed that, at the set time, tipped the person out into cold water. Both Randall and Carter are buried in Oxford’s Holywell Cemetery, which also contains the grave of Kenneth Grahame, author of another children’s classic, Wind in the Willows. The only real building recognisable from Tenniel’s illustrations is the Old Sheep Shop from Through the Looking-Glass. This shop still stands opposite Christ Church, where the real Alice would have bought sweets. Today, it is devoted to Alice memorabilia. Carroll was an accomplished photographer and he took many photos of the Liddell children, including Alice dressed as a beggar girl and Alice and her sister Lorina dressed in Chinese outfits. Carroll/Dodgson’s camera, made from Rosewood and bearing his initials C.L.D, is housed in Oxford’s History of Science Museum in Broad Street. Next door to the museum is the Bodleian Library, which contains first editions of Alice’s Adventures in Wonderland. 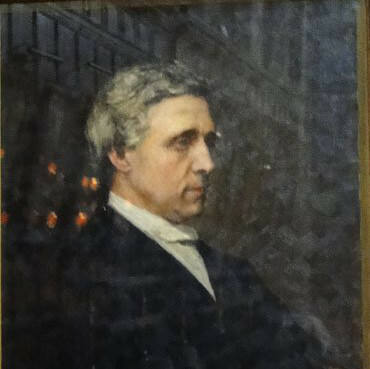 In Christ Church’s magnificent Great Hall there is a portrait of the young Lewis Carroll and its stained glass windows depict scenes from the book. It also contains brass “firedogs” guarding the fire that have long necks in the way Alice was portrayed when she grew in size in the Pool of Tears. The door leading from the High Table down to the Senior Common Room where the dons would drink their port after their meal is believed to have given Carroll the idea for the rabbit-hole. 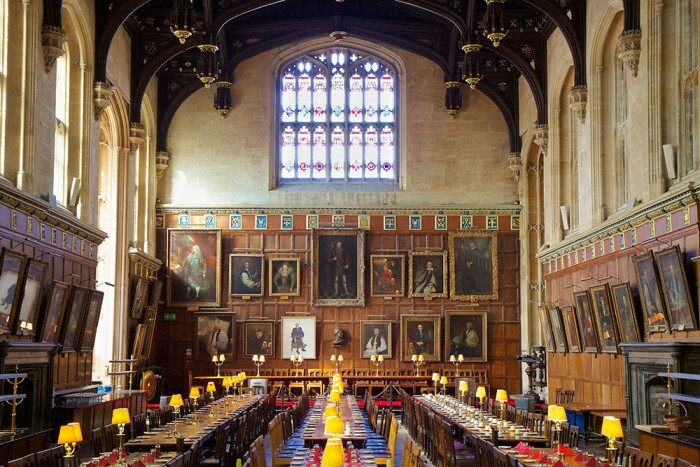 The college receives some two million visitors a year, especially since scenes from the film version of JK Rowling’s book, Harry Potter and the Philosopher’s Stone, as well as scenes from the film of Philip Pullman’s book The Golden Compass were filmed in the Great Hall. Every year Oxford celebrates the day that Lewis Carroll first told his Alice tale with ‘Alice Day’ co-ordinated by Oxford’s Story Museum, a private institution that is dedicated to the celebration of story telling.